At Buckeye Relief in Eastlake , the first marijuana seeds were planted on July 31 —four days after the cultivating facility received its final certificate of operation from the state as it nears the deadline of September 8 to get the Ohio medical marijuana program up and running. A deadline that will pass without any action. Buckeye Relief received the highest Level I cultivator application score in the state, according to the facility. A Level I cultivator is permitted to have 15,000 sq. feet cultivation area, whereas a Level II cultivator can only cultivate 1,600 sq. ft., according to the Department of Commerce. The department said it can issue up to 12 Level I licenses and 6 Level II licenses before Sept. 8. The director may issue additional provisional licenses after that based on the state's population and the patient population, according to the department. Buckeye is one of three of the 26 licensed growers in the state to have received the go-ahead with five more expected to get the green light shortly. The first crops there won't be ready until late November. They'll be sent to a processor to be transformed into one of the approved methods of consumption for those who are eventually cleared to receive medical marijuana. The state has received 104 applications for the 40 processing licenses but recently noted that only 13 thus far have met the minimum requirements for certification. In 2016, the state legislature approved medical marijuana for patients with any of the 21 medical conditions. The patients would have to visit with an approved doctor who would then recommend the edibles, oils, patches or other forms of marijuana other than smoking. So far the state has approved 222 doctors who have received the requisite training to approve the drug. 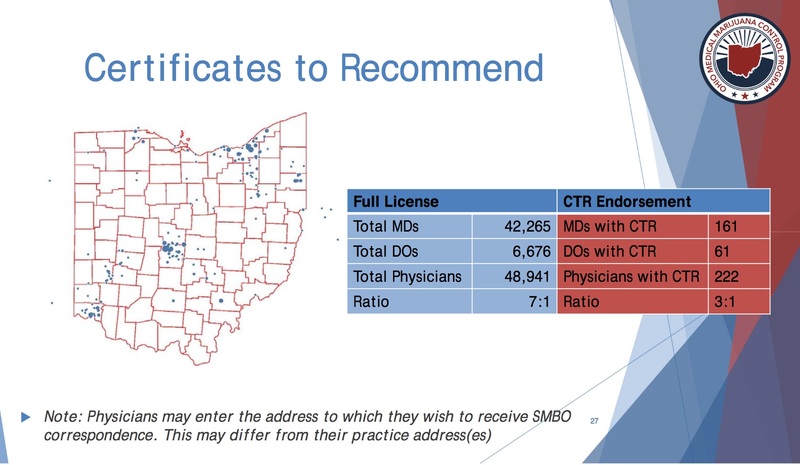 As for the potential patients, the Ohio Board of Pharmacy has yet to open an online registry but that step is expected to be taken closer to the products becoming available later this year.